I hope you follow along because when we get done you'll have built and flown your first model rocket. Questions asked from previous posts are answered too, so if you have questions, please leave them in the comments or email me. The instructions for most model rocket kits are wonderful. Estes has been doing this for years, and their experience shows. Let me stress one point right up front: always, Always, ALWAYS follow their suggestions for glues to use. You can sometimes use an alternate (I have almost 20 different kinds of adhesives for various situations), but their recommended glue will give you the strongest bond. Almost everything that needs assembly tells you to lay out the parts and make sure you have everything, and also to read through the directions first to understand things. This is a simple kit, so do it if you'd like, but it won't be a problem if you don't. For more complicated kits, I do recommend doing it. Lets look at the various parts, most of which are obvious. The biggest tube with the slots cut in one end is the body tube. In a simple rocket like this, it's main purpose is to hold all of the important bits in their correct places. The nose cone is straightforward, as are the fins. The parachute is the plastic sheet with the strings attached. So much for the obvious bits. The tiniest tube (it looks like a drinking straw) is the launch lug and it's used to steady the rocket on the launch rod. The length of elastic is the shock cord, remember I recommended replacing it with a longer piece bought at the store. The two cardboard disks, the medium sized tube and black ring will be put together with that little metal strip and become the motor mount. Using your x-acto knife, carefully cut the fins out of the balsa sheet. They're die cut and held in by just a few short bits of wood. If you want to, you can gently sand the fins (with the grain) with the fine sandpaper before freeing them. Make the same kinds of cuts to remove the smaller middle circles from the cardboard disks. Finally, you may need to open the inside of the squared-off loop at the bottom of the nose cone (see the picture). Do all of these carefully, and watch for the sharp knife. Make sure the fins fit the slots in the body tube. Sand them lightly if needed to ensure a smooth fit. The following steps are completely optional. Using the sandpaper, sand the seam on the plastic nose cone until it disappears. This isn't a quick process, but it does make for a much nicer looking end result. Lightly sand the entire body tube until you've scuffed the shine off. Don't sand too much, the purpose here is to remove the glassine layer, which will make for a stronger bond between the glue and the paper tube underneath. Take some of the Fill'n'Finish and thin it with water until it's about the consistency of pancake batter. Slather it on the body tube (I use my finger) and work it into the spiral groove. You won't need much, and most of what you use will be sanded away. Let it dry (it's pretty quick) and then lightly sand. The Fill'n'Finish sands easily, and when you get done there should be no spiral groove left. Repeat if you need to. Use the same thinned Fill'n'Finish to fill the grain of the balsa fins. Keep the coats very very light, and sand between coats when dry. When you do the fins, do both sides at once, because the balsa will warp slightly and this will help even it out. The warp will straighten out when both sides are dry. The reason for all this filling and sanding is because the smoother the surface, the less drag which makes for a higher flying rocket. I don't do it for every rocket, but I do take the time for most of them. The paint job looks much nicer on the smooth finished surface too. What is a "fishing swivel?" Also known as snap swivels, they're used to prevent the fishing line from twisting. They have a small loop on one end and a large loop on the other end that opens like an old fashioned safety pin. Here's a (not great) picture of a few, and like I said, you'll only need one, and it's optional. Also in the picture you can see the package of sewing elastic, the glue and Fill'n'Finish, and an x-acto knife. 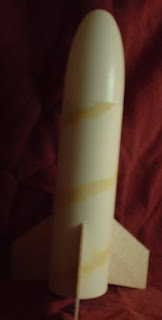 This is our rocket so far, after sanding the nosecone seams smooth and filling the spiral grooves on the body tube. Total sanding time was maybe 20 minutes. If you did those steps, you'll notice that the tube is a little fuzzy. Don't worry about that, because we'll smooth it out when we spray primer. I also had to spend a few minutes sanding the tabs on the fins so that they would slide easily into the slots. Nothing is glued together yet. You may have noticed that the fin tabs have a small slice trimmed out at the bottom. This shallow notch fits over the black ring of the motor mount. This particular rocket boasts a nice bit of engineering because everything fits together and reinforces itself, making for robust construction. In fact, although we'll be flying this bird stock on B and C motors, I've seen the same kit strengthened and modified to fly on I motors (128 times more powerful)! Now, I'd like to talk about what actually happens during the flight, and some of the basic aerodynamics involved. Model rockets are set up on a 'launch rod', which ensures that the rocket stays straight until the rocket is moving fast enough for the fins to keep it stable. A good way to picture how the fins work is to compare it to a weathervane, and how it always points into the wind. When a rocket is moving through the air, its flight through the air provides the 'wind' that the fins work with. Everyone has stuck their hand outside a car window at speed and felt the rush of air. When you keep your hand flat to the ground, the air moves smoothly past it, but if you try to cup your hand against the wind, then the wind pushes against it. The fins work in the exact same way, and it's this push that causes the rocket to stay straight. The main effect of this is that the straighter the flight, the less drag the rocket has to overcome and the higher it will go. I'll go into other aspects of this as we go. Next time, we start gluing things together! And as always, leave questions in the comments. Thanks! 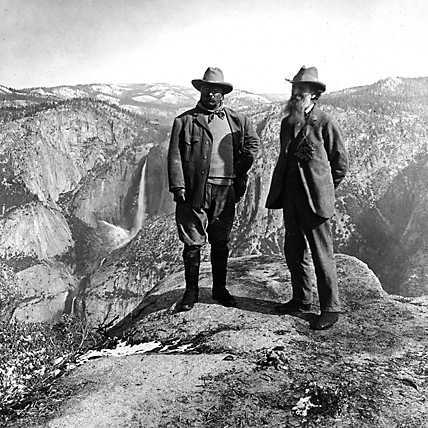 Mostly, we believe that you should be outside as much as possible, playing and being active. It would be foolish though to act as if the internet didn't exist, especially when you find an interactive website as cool as iNaturalist.org. Follow that link and you'll discover an ever-expanding library of plant and animal observations from around the world. Suppose you find an interesting fungus while hiking, you can take a picture (or sketch it and make notes like early naturalists did), go online and identify it. If you can't find it there, post it yourself and other folks can help you discover what it is. There are a staggering number of types of living things in our world, and it's a good feeling to be able to identify some of them for yourself. The student who made fun of playing the guitar under a girl's window will never read or write poetry under her influence. His defective eros cannot provide his soul with images of the beautiful, and it will remain coarse and slack. It is not that he will fail to adorn or idealize the world; it is that he will not see what is there. We're going to start a series of posts where I'll build a basic model rocket kit online. The idea is to show the process step by step, including pictures and passing along tips and tricks that I've learned along the way, while you follow along and build your own rocket. Please feel free to ask questions as we progress, and hopefully we'll see some pictures as folks build and launch their own rockets. 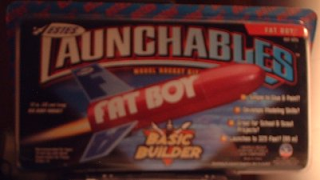 The rocket we're going to build is the Estes Fat Boy (see below). You used to be able to get this rocket in the toy section of WalMart, look for model rocket kits near the car model kits. You can also find it in some craft stores and hobby shops, sometimes in other packaging like a bag or box instead of the plastic bubble-package pictured, but it will probably cost a little more. If you'd like to build along and can't find the Fat Boy, you can get something similar because the basic steps will be the same. The Baby Bertha or Alpha would also be good choices, although most any Estes rocket kit will do. Now is also the time to gather building materials. If I mention a specific brand, it's because I've used it and know it works. There are all kinds of products out there that'll work just as well. You're going to need an x-acto knife (or equivalent, you could get by with a single-edge razor blade). You'll also need some yellow or white glue. I recommend Elmer's carpenters glue, if you get the exterior stuff it's gelled and doesn't run and drip nearly as much (it's also brownish). 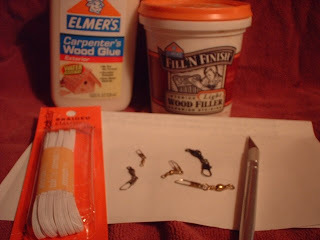 You can also use Eileen's Tacky Glue, TiteBond, white school glue, or anything similar. The only other must-have will be a pencil. The following things aren't strictly necessary, but if you use any or all of them you'll have a nicer looking and better flying rocket. They're completely optional, and I'll note when to use them if you want to. I highly recommend that you get a pack of sewing elastic. You want to get the flat 1/8" wide stuff, and it'll probably be 3 yards long. WalMart sells it for about a dollar, back in the sewing department. Super-fine sandpaper, at least 220 grit (the higher the number, the finer the grit). You can find this in the hardware department in sheets, or small pads of it in the craft section. WalMart sells an assortment from 3M called 'wet or dry' sanding pack that contains two sheets of 220, two of 320 and a sheet of 400 grit. Elmer's Fill'n'Finish. Also found in the hardware department, get the smallest tub of this. If they have more than one kind with similar names, hold a tub of each in either hand and pick the lightest weight one. We'll use this to fill the grain in the balsa wood fins and the spirals in the rocket body. You could use a lightweight spackle too. Fishing swivel. This makes attaching the parachute easier. Don't buy a package of these, but use one if you can borrow it or already have one in your tackle box. You can wait to get primer and paint, and I'll talk more about it later. Here's a little about it up front though. Spray primer. I use Rustoleum sandable primer, it comes in white, gray, or even black. Get whatever they have. Spray paint. Rustoleum or Krylon is what I use. Get whatever colors you want to use. The little cans of Testors paint near the models are cool colors, but very expensive for their size. Masking tape. You'll need a roll of 1/2" tape if you want to paint your rocket with more than one color. Next up, we'll take a look at the various parts of the kit and do some pre-assembly work. Maybe you recognize the flag above. It's known as the Gadsden Flag, and was first mentioned in 1775 when it was painted on the drums of U.S. Marines. There was some sentiment that the rattlesnake should become the national symbol of America instead of the Eagle. Among the reasons given were: because he never starts a fight without provocation, gives clear warning that his anger is aroused, yet never surrenders once the fight begins. If you look carefully at a full-sized flag, you would find that there are thirteen rattles on the snakes tail, one for each of the original states. The original Gadsden Flag was presented to the first Commodore of the U.S. Navy by Colonel Christopher Gadsden, and was used as Commodore Hopkin's personal standard (flag) on whatever ship he was aboard. A variation of the flag was adopted by the Navy and every ship flew it in addition to the U.S. flag. It's now known as the First Navy Jack. Eventually, it became naval custom for the ship with the longest period of active service in the navy to fly the First Navy Jack. In 2009, the aircraft carrier USS Enterprise recieved that honor upon the decommissioning of the carrier USS Kitty Hawk. Flag images courtesy of www.Gadsden.Info and www.NavyJack.Info, along with much of the information included above. Follow those links for more related history. Whether you call it a journal, a diary, a dream book or anything else (I’ll use the term journal here), keeping a record of your life can be a rewarding effort. The important thing to understand about a journal is that it should be written for yourself, because you will get the most use out of it. Even if no student from the future reads your journal, you will find it useful as a way to vent about everyday frustrations, to make note of little events and conversations that may be important later, or to explore your feelings in private. At the most basic level, a journal can help you remember details when you go back and reread things you’ve written in the past. As an example, I keep a separate “hiking journal,” and each time I go out I add an entry for the day. Each entry will have the date, where I hiked, length of the hike, who was with me and other details about what the weather was like, what the trail was like, people I met, animals and/or bugs encountered, and if it’s an overnight campout, what the campsite is like. This way, before I go on another trip, I can reference my journal and see if there’s a particular trail I’d like to hike again, perhaps during a different season (i.e. Spring vs. Fall). Also, sometimes it’s nice to just read old entries because the words remind me of the hike and I recall details I might have otherwise forgotten. There is no single correct way to write in a journal, and finding your own style may take a little time and experimentation. There are three basic questions you’ll need to answer for yourself, but don’t overthink and make it more complicated than it needs to be. The first question is “when should I write?” The simplest answer is, “whenever works best for you.” The trick is to be consistent. Maybe you jot down a few quick lines before bed every night, or you write for a while each weekend on a quiet Sunday morning. Some people just journal whenever the mood strikes, sitting under a tree between classes, or in little short bursts throughout the day. The second question is “what do I write?” Again, the simplest answer is, “whatever YOU want.” Whether you write quick notes, long essays, rants and ravings, song lyrics, stream-of-consciousness scribbling, poetry, list books you’ve read, draw cartoons or paste pictures into your journal, or even any/all of the above, there’s no wrong way to journal. Your personal style of journaling will evolve over time, in the same way that you yourself will change as a person over time. If this sounds like blogging, it is, or rather blogging is a lot like journaling except that blogging is journaling in public. On a blog, you’re putting yourself out there for everyone to see. A journal can be much more private and personal. The third question is “what should I write in?” You can guess what the answer is. If you want to keep your journal using your laptop’s word processor, then by all means do that. Some people find that they’re inspired to write regularly by getting a really nice notebook and pen. Others find that a nice notebook is intimidating, because they’re afraid to scribble everyday things into a ‘special’ book (this is nonsense, by the way.) I know several people who use sketchbooks as a journal, and fill them with words and drawings on every page. There is a neat type of journal called a ‘five-year diary’ with 366 pages (leap year! ), and each daily page is divided into five sections where you write a few lines each day. At the end of the year you start over with the same pages, and you can read your past entries as you write new ones. You don't need a lot to start journaling. A few sheets of paper and a pencil will suffice. Give it a try, but make it an honest try. Don't give up after a few days. Make an effort over a week or two and it will become a habit. You will discover for yourself that it's useful and even somewhat comforting to have a regular time to sit quietly and write down one's thoughts. If you do try, let me know. I'd love to hear how it goes for you. (Cross-posted to Jennifer's History and Stuff. "I've done everything I know how to do, so if this doesn't work then we'll learn something." Right up front I'll warn you that this game can be considered gambling. I pitched pennies quite a bit while growing up, and yes, money exchanged hands, penny at a time. I trust that you're mature enough to deal with it if it offends you, and likewise bright enough to figure out how to change the rules to eliminate the stakes if you so desire. The game is simple. You and your friends stand a set distance from a wall and each tosses, in turn, a penny. The object is to have your penny land closer to the wall than any other. If yours is the closest, you collect all the pennies. This is best played outside against a brick or concrete wall, indoors on tile. Carpeting changes the game significantly. There are all kinds of "house rules" that can be agreed upon beforehand. Rather than list the one's we used, you can think of your own. As for disagreements, c'mon... it's pennies! The tree is named Hyperion, and it's located somewhere in California. They keep the real location of the tallest trees a secret to keep people from damaging them. Ever see where someone carved their name or initials into a tree somewhere? Yeah, those people. More info on Hyperion and other tallest trees can be found here. At the link is a composite photo showing the full height of one of these trees, including someone stationed at various points as they climbed. Here's the final part of our series to build your own box hockey game. If you have any questions, feel free to leave 'em in the comments and I'll answer them as soon as I can. Ok, in the first three parts we built the main part of the box hockey table, and all that's left is a few little finishing details and some rules to play. Using the leftover scrap hardboard, cut out two paddles and six triangles as shown in the diagram below. Sand the edges lightly to smooth them out. The paddles are what you use to hit the checker puck with. 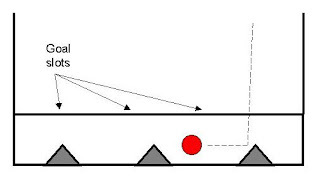 The triangles are a later addition because sometimes the puck slid directly into a goal, often hitting the back wall and then popping back out. 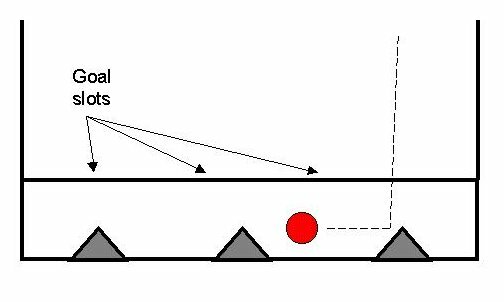 When the puck is moving fast enough, it's hard to tell if a goal was scored or not, so the triangles deflect the moving puck and prevent arguments. 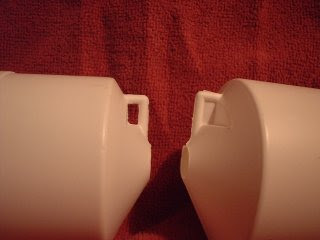 Use white glue or hot glue to fasten them into place against the back wall behind each goal slot. Use a yardstick or tape measure to figure out the center line of the board, and mark it with a sharpie or other permanent marker. That's it! If you want, you can flip the board over and mark or paint a checkerboard onto the bottom, we usually add a simple backgammon board too. These are all suggestions based on what works for us. House rules are common, and on the playground it's not unusual for the winner to call special rules for the next game. The terms puck and checker are used interchangably. The two side goals (bigger) are worth 1 point each, the middle, smaller goal is 3 points. The puck doesn't have to completely go through the slot for it to be a goal. We score the point if it breaks the plane of the back of the slot (slide the paddle along the back of the slot board, and if the checker moves, then scoooooore! Game ends when one player scores 11 or 15 or 21 (decide at the start). Skunks are 7-0 or 11-1 scores. Decide who goes first by flipping the checker (heads or tails) or by putting the puck on the center line and both players trying to hit it on the count of 3. Or just let the younger player have it first. You can only hit the puck if it's on your side of the center line. You can't touch the puck with anything but your paddle. Have fun. No getting mad. I'd really love to hear if you make a box hockey for yourself, drop me a line if you do.